Harvey Leake began researching the history of the Four Corners Country more than twenty five years ago, focusing on the explorations and activities the Wetherill family from whom he is descended. His investigations have taken him into many of the Colorado plateau's remote canyons as well as into archives, libraries, and family historical collections. 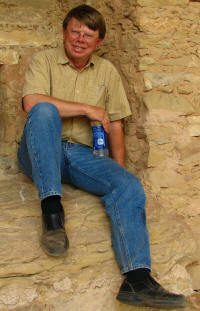 He assists in the interpretation of historical documents and photographs for the Wetherill archive at the Anasazi Heritage Center in Dolores, Colorado and is a retired Electrical Engineer. He holds a Bachelor of Science degree in engineering from Arizona State University and a Master of Arts degree in theology from Fuller Theological Seminary. about 1855 until 1926. Raised by his grandfather and mother, Wolfkiller learned the ancient wisdom of his people. He grew up seeing the beauty in nature and discovering how to face the wind, storms, cold, and even death with optimism and courage. Through his embrace of the natural world, he developed both a rare depth of character and an understanding of human relations that guided him through times of adversity. Wolfkiller's story was recorded and translated by pioneer trader Louisa Wade Wetherill, who met him after moving to his community in the early twentieth century. Books can be ordered through Amazon or Barnes & Noble.